In the summer of 2009, amidst reported delays with IRIS in Hollywood and news that two new shows would take up residence in New York City (Banana Shpeel and Zarkana), another more interesting rumor surfaced: of a third musical-revue type show similar to The Beatles LOVE and VIVA ELVIS, this time with regards to the recently departed Michael Jackson. Although there had been rumors of a mash-up before – Jackson himself was a fan, and the success Cirque found with LOVE suggested the format might be viable to him – nothing concrete between the two parties had ever come to pass. At the time Cirque suggested nothing was in the works between it and the King of Pop’s estate; however, just three months later it was clear Cirque du Soleil wanna be startin’ somethin’ with the Jackson Estate. And we didn’t have to wait too long for a more official announcement. 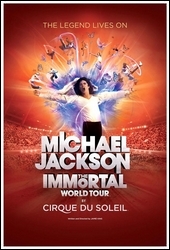 On April 20, 2010, the much-rumored Cirque show featuring Michael Jackson's music and inspiration was announced as Michael Jackson THE IMMORTAL World Tour. THE IMMORTAL World Tour takes place in a fantastical realm where we discover Michael's inspirational Giving Tree - the wellspring of his creativity. The secrets of Michael's inner world are unlocked - his love of music and dance, fairy tale and magic, and the fragile beauty of nature. The underpinnings of THE IMMORTAL World Tour are Michael Jackson's powerful, inspirational music and lyrics - the driving force behind the show-brought to life with extraordinary power and breathless intensity. Through unforgettable performances THE IMMORTAL World Tour underscores Michael's global messages of love, peace and unity.